Ensure that your plant is operating properly, safely and efficiently and easily fix any problems as quickly as possible. From nuclear power plants and oil refineries, AXIS has over 13 years experience providing engineers survey grade data for maintenance and design projects. 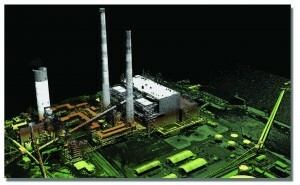 AXIS HD-LiDAR technology accurately locates existing structures, equipment and obstructions that affect the design of new power plant renovation projects.